The Bar|Scan Asset Management System is a very comprehensive program, which often generates many questions about bar code hardware, software and the selections of software modules that Bar|Scan has to offer. In order to utilize Bar|Scan to its full capacity, we offer technical support to our customers. You can use this page to locate the assistance you may need quickly. If you do not have a current support contract, you will be billed for technical support. If your current period of support has expired, you can obtain additional support by contacting us at 805-777-0079. We send out upgrade CDs to all customers on annual support on a regular basis not less than once per year. Upgrades incorporate new features garnered through feedback from our customers. They are also necessary to incorporate changes to remain compliant with new operating systems and new bar code handhelds. An unscheduled upgrade CD may also be sent to a customer to resolve a problem that the customer has identified. UPS domestic ground shipment costs are included as part of our support. Priority shipping and international shipping costs are not included. Getting Non-contract Equipment Repaired: All flat rate, non-contract and non-warranty, customers are now required to use the Return Material Authorization (RMA) process. When using the RMA form located at https://www.zebra.com/us/en/support-downloads/request-repair.html or when contacting the Support Center at 1-800-653-5350, customers will be quoted the Tier Two price and be notified of the possibility that the actual charge may be different, based on the repair required. Any abused units will be quoted directly at the Service Center. E-mail Bar|Scan Technical Support with your Asset Management questions at techsupport@barscan.com We will be happy to assist you. Please make sure to include your BarScan License Number, e-mail address and phone number so that we may reach you. Your License Number can be found by performing a mouse click on the Help pull down from the main Asset Management desktop and selecting the ‘About Bar|Scan for Windows’ option. Did you know that you can export a report, asset, location, etc. and send it to us as an email attachment? On the Browse tab, double click the report name until it turns green (or use the F4 and Enter key). This is the Range Feature. YOUR COMPANY NAME REPORT TRANSFER 2018-09-07T15_19_13.FPT. You can now attach these two files to your support email. In Bar|Scan, make sure that all Tables are closed. From the Bar|Scan Main Menu select File->Import->Data Transfer File. Browse to the location where you placed the attachment. On occasion, in order to help us to determine your support issue, we may request that you compress and send us your entire company database folder and also your SYSUSER folder. You or your IT support can perform this function in a matter of a few minutes. If you are not familiar with this process, we recommend having your IT support perform this for you. If the BarScan application is located on a server, your IT support does not need to be at your desk. For compressing these folders, we recommend that you utilize either the tool that comes with Microsoft Windows for compressing (zipping) folders or one of several others available. Winzip is a popular compression program (www.winzip.com). You will need to logout of BarScan prior to compressing these folders. If you have a Local Area Network (LAN) license, you will need to also verify that all other users are also logged out. There is Knowledge Base Article on how to verifying that users are logged out. Once you have the two folders compressed, you can use one of two methods to transmit your two zipped files to us. There is a link to send files on our website www.barscan.com . Select the ‘Support’ menu then ‘Secure File Upload’. The other method is to click on the link below our signature line on any email from us. It is easy to locate your company database folder. Most customers keep their database in a sub-folder to barscanw but this is not a BarScan requirement. You will need to always send the SYSUSER folder. Some customers may have more than one company database folder so you will want to send us the one that is experiencing the support issue. In the above example, you would compress the ‘SAMPLE100K COMPANY’ folder. 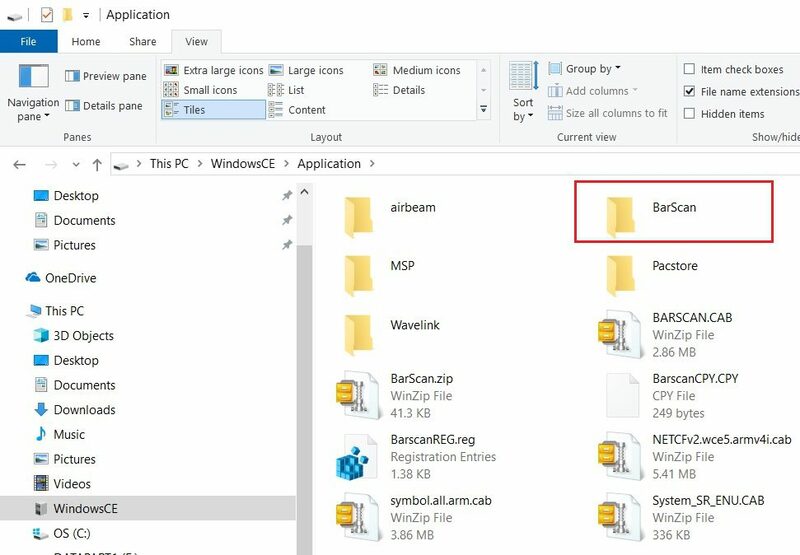 The SYSUSER folder location is always located in the barscanw folder. For example, on your server this would be barscanwsysuser. Once you have completed the above steps, you can continue to use your BarScan application unless we request that you do not do so. You can manually retrieve all of the data from your Windows Mobile based handheld computer. If you are emailing the data to us for analysis, retrieve everything in both the application folder and the BarScan folders and compress it into a .zip file before email it, or use the ‘Secure File Upload’ item on the Support tab of our website to sent it to us. You can also fax Bar|Scan with your technical questions to 805-777-0054, attention Bar|Scan Technical Support. Please make sure to include your License Number, address and phone number. You can always call Bar|Scan at (US) 805-777-0079 PST with your technical questions. Please have your License Number ready when you call. The License Number can be found by performing a mouse click on the help pull down from the Bar|Scan Main Menu and selecting the About Bar|Scan option. Telephone Support Hours: 8:30 am to 5:00 pm Pacific Time. Finally, to assure compliance with government regulations, Bar|Scan, Inc. cannot offer any accounting or tax advice in conjunction with the operation of any of our software. For commonly encountered situations and their associated solutions, please view our extensive Knowledge Base. Due to the sophistication of the Bar|Scan system, we offer the purchase of our Telephone and Internet Support Service after the first year of free support ends. Bar|Scan, Inc. will provide telephone support for any licensed Bar|Scan users to answer questions and assist in operations of all of our systems, Monday through Friday, 8:30 A.M. to 5:00 P.M. Pacific Standard Time, excluding holidays. Telephone and Internet Support includes answering questions regarding the operation of the system and related procedural issues, helping to resolve problems, and fixing any software issues which may arise. It does not include support of your Operating System, Network, or other Applications. We will advise you on these other items when possible. To continue receiving Telephone Support for a period of 12 months, we must receive payment on or before the expiration date. An invoice for renewal is automatically generated, however, we recommend the processing of a Purchase Order in order to expedite the process. Emergency 24-hour support is available via after hours voice mail paging system is also available for an additional fee. Although our normal Telephone Support is more cost effective for a majority of our customers, you may elect to be billed in advance or provide a credit card for hourly support. The hourly rate for support is $125.00. The minimum charge per call is $62.50. Hourly support does not include program or documentation updates. Hourly support is not available for emergency service. In addition, hourly support will only be provided if you are using Bar|Scan version 2.8.1 or newer. Bar|Scan, Inc. reserves the right to cancel telephone support for any customer for non-payment of any invoice from Bar|Scan which is past due. Any support balances will be pro-rated and applied to outstanding invoices. If, after the pro-rated amount is applied, a credit balance remains, it will be refunded to the customer within 60 days.